Vatican II’s Lumen Gentium re-emphasized the universal call to holiness of every member of the Church, saying that “all the faithful of Christ of whatever rank or status, are called to the fullness of the Christian life and to the perfection of charity” (no. 40). The document later says that “married couples and Christian parents should follow their own proper path (to holiness) by faithful love” (no. 41). How often do we, the laity in the Church, fall prey to the fallacy that holiness is reserved only for priests and religious, or those who already “have it all together” and live in idyllic perfection? A modern saint and her husband challenge that notion through their marriage and holy life together, responding whole-heartedly to Jesus’ call of discipleship. 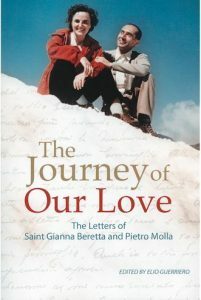 The Journey of Our Love: The Letters of Saint Gianna Beretta and Pietro Molla presents, in a faithful and precise translation, letters exchanged between St. Gianna Beretta Molla (a medical doctor, canonized a saint in 2004) and her husband Pietro (who worked as an engineer). The book begins with words from two cardinals followed by two prefaces, one written by Pietro Molla and the other by his daughter, Gianna Emanuela, who was named after her mother and for whom St. Gianna sacrificed her life. An introduction of over 40 pages sketches a context for the letters, detailing the cultural setting of these Italian lovers, providing biographical information about Gianna and Pietro, and expounding upon certain themes and devotions of their spiritual lives. As Elio Guerriero writes in his introduction, “they [Gianna and Pietro] show us that love centered in Christ takes away nothing of the beauty of being in love” (p. 3) There is no divide for Gianna and Pietro between their love for God and their love for each other. It was their love for Jesus that drew them deeper into love for each other and for their children. Theirs was a tender, strong human love, often intimate and romantic, that was transformed by the love of God. Seventy-three letters between Gianna and Pietro, spanning from 1955 to 1961, are presented in their entirety in four sections. First are the engagement letters, written over the course of 1955. It is clear in these letters that Gianna and Pietro set Christ at the center of their relationship from the very beginning, preparing for the Sacrament of Matrimony through prayer and frequent reception of the sacraments. Their letters in the first year of marriage follow. Gianna and Pietro understood that they had received “grace upon grace” from the Sacrament of Marriage and they were resolved to live that sacrament to the fullest, accepting any crosses that came their way with open hearts. Pietro’s work trip to the United States in 1959 spanned nearly two months, leaving an expectant Gianna back in Italy with two young children and another on the way. The intensity of their love and devotion is made plain through frequent letters while they were apart, sometimes written several times per day. These form the third section of the book. The final section, their “letters of maturity,” is the shortest section of the book, for the couple was less frequently separated and often chose instead to communicate over the phone. Years had passed since their wedding day and their love and affection had strengthened and matured. These letters speak of sweet memories and nostalgia from previous trips spent together, and a love that had now expanded to embrace the lives of their three children. Despite their happiness, the couple was not immune from suffering and hardships. Pietro was known among his family and friends for his dedication to his job, which sometimes created tension between time spent working and time spent with his family. While Gianna was able to accompany him on some of his trips, he spent many weeks traveling for work apart from his wife and children. The couple, so desirous of children, suffered two miscarriages during their marriage. They struggled with the usual difficulties that come with marriage and family life: illness in the family, exhaustion, education, work and finances. But in all their difficulties, Gianna and Pietro lived the virtues of faith, hope, and charity, trusting in the loving plan of God for their lives. These letters clearly show how devoted they were to each other, and above all how devoted they were to getting each other and their little family to heaven. Gianna and Pietro were not a holy couple of ages past; they were two people who lived the call to holiness in their everyday life in our own era, consecrating normal acts of work, housekeeping, childrearing, and even leisure to God. Photographs from their engagement, their wedding day, their travels and adventures, and time spent with their children are printed periodically throughout the book, giving faces to the writers. Each letter is a snapshot, a brief glimpse into the hearts of two people very much in love with each other, with life, and above all, with Jesus Christ. We are drawn into their lives to see their unique personalities, their particular interests (including mutual enjoyment of the outdoors and classical music), their interactions with their extended families, and the strength they received from frequent and ardent prayer. The letters of this holy couple are filled with words of love for each other (“I kiss and embrace you with all my love,” “you are my life,” “everything reminds me of you”); words of love for their children, who they referred to as their “treasures”; and an ardent desire for the other always to be not only happy, but holy too. Truly Gianna and Pietro were “one flesh,” united in body, mind, and heart, in sickness and in health. Their letters, full of love, joy, and honest humanity, speak for themselves. Whether you are single, dating, engaged, or married, this is a must-read, for the testimony of these two lovers bears witness to the love of God, a love that is stronger than death. Caty Long is a first year Master of Theological Studies student at the Pontifical John Paul II Institute and currently an office assistant for the Secretariat of Laity, Marriage, Family Life, and Youth at the USCCB.